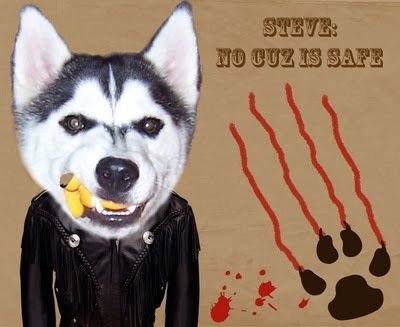 Hey Pups, it's Steve. I'm here with the second installment of our 3 part Q&A series. This one might be kinda boring since Kat and I have a lot of similarities. But I'll try to put down my unique qualities!!! What color is the collar you’re wearing right now? Blue with bones on it. Who is your favorite person other than the people you live with? Ummm... this is a tough one. I guess the people at day camp as well. They do tend to spoil me, especially the new boy who likes to play with me one-on-one. How much do you weigh? 43 lbs, Mom weighed me yesterday. I haven't gained weight in a month. Maybe I'm going to be a small Sibe. Most expensive thing you’ve ever chewed up? Probably my bed. Dad took it out of my kennel during the day one day, but it was close enough that I managed to pull it inside. It looked like it had snowed in the kennel when Mom and Dad got home because there was fuzz everywhere! Do you like other Dogs? Definitely and I prefer if they are bigger than me. Who is your best non-human friend? Kat, even when she's being bossy. Squeaky Toys or Tennis Balls? Squeaky toys. Balls are for dogs who don't know better. Do you like to be brushed? It's okay. I am good at just lying on the ground and waiting for it to be over. Peanut Butter or Cheese? Well I definitely like both. Mostly I just get peanut butter though. Do your people cut your toenails? No, my nails stay nice and trimmed from walks and bike rides. Any formal education? Yes, we went to a two week board and train and we are still going to weekly lessons. Sometimes I try to do good at lessons, but sometimes I don't feel like it so the trainer hasn't let me graduate. Couch potato or Energizer Bunny? I am probably a couch potato unless Kat wants to be a bunny then I will match her, energy for energy. What did you have for breakfast? 1/2 cup Canidae. Can you hunt (aka have you ever killed anything living)? No, but I would like to try. I like to catch bugs in my mouth but then I let them go so I can bat them around. When & why was the last time you went to the V.E.T.? A couple weeks ago because of my (cringe) puppy mange issue. Where do you sleep at night? In front of the shower in Mom and Dad's bathroom. Do you like to swim? Yes, it's pretty fun. I like to try to push Kat out of the pool. Can you make puppies? No. If it involves girls, gross. Do you give kisses? Not very much. I prefer just sniffs. Can you potty on command? I can. I also can go potty continuously for periods of time that cause my parents amazement. They don't know how big my bladder really is! To Cuz or not to Cuz? Yes. We got some new ones and I chewed the feet off of them. I didn't do that to the old ones. My mom just got Photoshop and so it prompted her to create this picture. Dad helped and I'm not sure I appreciate either one of their efforts.